Get your daily scoop of what State of the Union is watching today, October 10, 2013. 2) Pressure from the GOP base. A conservative group is calling on House Republicans to include an anti-abortion provision in any measure that would reopen the government and raise the debt limit. "I strongly urge you to include language that protects religious freedom and ends federal subsidies for abortion under Obamacare as part of any continuing resolution or increase in the borrowing authority of the federal government," wrote Faith and Freedom Coalition founder Ralph Reed in a letter to House Speaker Boehner. 3) Thumbs down for government. More Americans now say dysfunctional government is the top problem facing the country. 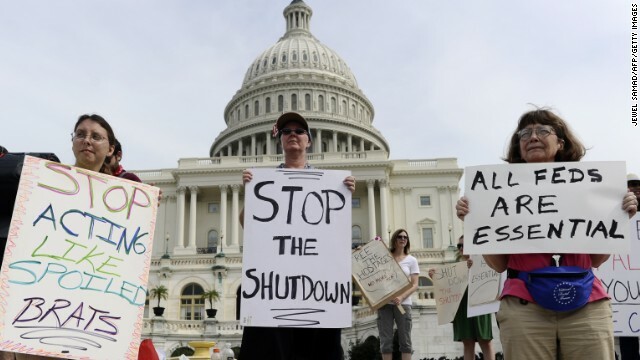 According to a new Gallup poll, 33 percent of people surveyed said dissatisfaction with government as the number one issue, while 18 percent cited the economy. 4) But can she sway voters in Jersey? Sarah Palin is headed to the garden state to campaign for New Jersey Republican senate candidate Steve Lonegan. "I am honored to have Governor Palin join us for the largest grass-roots campaign event in New Jersey history," said Lonegan. Polls indicate Newark mayor and Democrat Cory Booker leading Lonegan by 12 points one week out from the election. President Obama won New Jersey handily in 2012. 5) McAuliffe remains in the lead. One month out from the Virginia governor's election, Democrat Terry McAuliffe continues to hold a single-digit lead over Republican Attorney General Ken Cuccinelli. A Qunnipiac University poll released today showed McAuliffe leading Cuccinelli 47 to 39 percent, with Libertarian candidate Robert Sarvis getting 8 percent support. The survey found women backing McAuliffe 53 to 34 percent, while men supported Cuccinelli 45 to 41 percent.